Kansas Speedway is the second of four 1.5 mile tri-oval track locales in the 2011 Chase for the Sprint Cup. 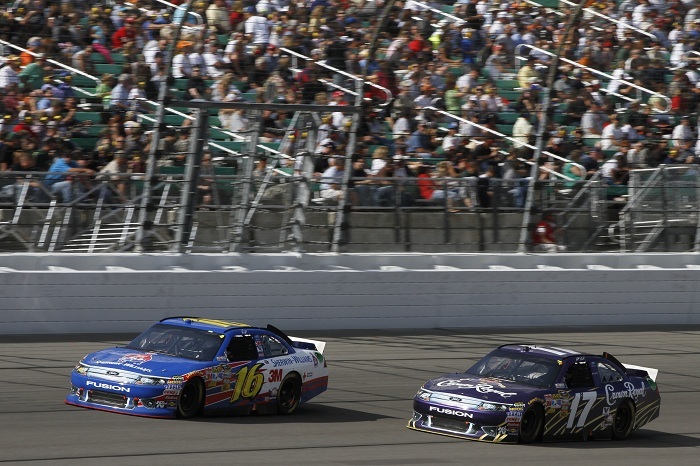 At the first so-called "cookie-cutter track", Tony Stewart become an early championship favourite when he won the Chicagoland Speedway event on fuel mileage. With 43 NASCAR Sprint Cup series drivers entered for the Hollywood Casino 400, the 12 Chase drivers continue to be under a microscope as some contenders are attempting to assert themselves in this fourth event in the 10-race championship fight. Non-Chase driver Greg Biffle in the #16 Ford took the NASCAR Sprint Cup Series pole Friday outrunning his Roush Fenway Racing teammate and Chase points leader Carl Edwards. One of the 29 other cars and teams caught in the delicate spot of racing for wins without performing any costly moves against Chase contenders, Biffle was undaunted from racing to win. However, the #16 driver himself would realize having raced within the NASCAR Sprint Cup championship format in previous years. Starting in 19th place, the Hendrick Motorsports #48 Lowes Chevrolet was led to the front quickly by the skillful Jimmie Johnson. Up to 9th place after only the first 15 laps, Johnson took the lead for the first time in the Hollywood Casino 400 at lap 24. Competitors and race fans would soon realize as the Kansas Speedway Sprint Cup event endured the force of the #48 team was in full force. After a rather dormant existence in the 2011 Chase for the Sprint Cup, Jimmie Johnson resided at the front for 197 laps over the 267-lap race distance. At one point in the race, Johnson pulled out a 12-second lead on the second-place running vehicle. Other than Jimmie Johnson, the Roush Fenway Ford Fusions of Matt Kenseth and Kansas race pole winner Greg Biffle recorded the only significant collection of laps at the end of the Hollywood Casino 400. With Biffle leading most of his 23 total laps early in the #16 Ford, Matt Kenseth led for 26 laps in the #17 Crown Royal Ford. Between lap 64 and lap 66, Kenseth and Biffle battled to stay at front prior to pit stops. Important for the 2011 NASCAR Chase standings, Kyle Busch in the #18 Toyota, Kurt Busch and Jeff Gordon would lead laps during the Kansas Speedway event netting a single championship point a piece. While Johnson enjoyed a glorious time at the front of the Kansas Speedway event, the rest of the Hendrick Motorsport team participated in a relatively quiet scheduled 400.5-mile event. Previous Kansas track winner Mark Martin came home 10th in the #5 Chevrolet while Dale Earnhardt Jr soldiered through a rather uneventful race in the #88 car. Concluding without a tire issue, the 14th place finish was improved over the previous two NASCAR Sprint Cup races. 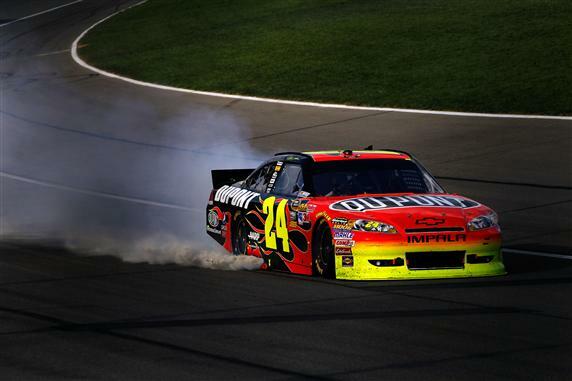 The final Hendrick Motorsport car, the #24 Chevrolet of Jeff Gordon, had a dramatic end to his day. Chancing older tires against the force of new tires, Gordon and the #24 Dupont stayed on track improving his track position. Restarting on lap 211, Gordon and the #14 Chevy of Tony Stewart made slight contact causing the #24 car to lose pace, falling out of the top-10 quickly. As the end of the car neared, Jeff Gordon's day turned worse when mechanical problems caused the Hendrick Motorsports engine to break spectacularly with only on lap 265. Dropping to 34th place at the end, the timing of this caution inadvertently threatened what was an almost guaranteed sprint to victory by teammate Jimmie Johnson. In the late stage of the Hollywood Casino 400, the #4 Red Bull Toyota piloted by Kasey Kahne. Starting 5th and demonstrating strong race pace with the Toyota Camry stock car, Kahne lost considerable ground early at Kansas Speedway on a pit stop under the race's first caution on lap 21. Combined with a broken jack, Kahne's entrance out of pit road was blocked by the #48 car of Jimmie Johnson. Bypassing the #2 Dodge of Brad Keselowski in late laps at Kansas, Kasey Kahne was the closest contender showing any ability of defeating the Lowes-sponsored Chevy. On a green-white-checker restart resulting from the blown engine of the #24 Chevrolet, Jimmie Johnson obtained a major jump that allowed a safe distance ahead of Kahne through the final 2 laps of the race. 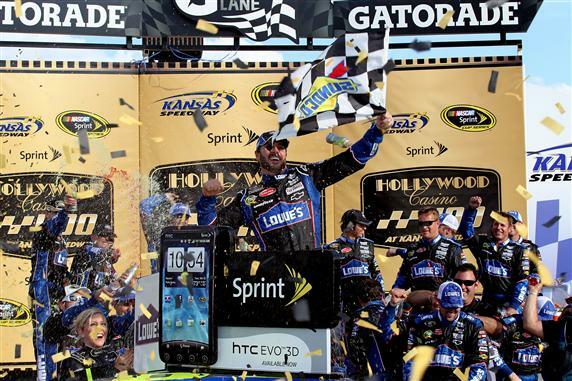 Winning his 55th NASCAR Sprint Cup Series event, the Kansas victory was Johnson's first since the Talladega spring 2011 race. Behind second place Kasey Kahne in the finishing order of the Hollywood Casino 400 was Brad Keselowski, Matt Kenseth and Carl Edwards. Besides non-Chase driver Kahne, four other drivers outside of the 12-driver end of season points fight for 2011 were in the Kansas race's top-10. From 7th to 10th were the cars of Clint Bowyer, Greg Biffle, Marcos Ambrose and Mark Martin. The Hollywood Casino 400 top-4 consisted of a Chevrolet ahead of a Toyota with a Dodge and a Ford resulting in some close manufacturer parity. However, Chevrolet clinches the Sprint Cup Series manufacturer's championship thanks to the #48 Impala's Kansas win. Elevated in the points with the win, Jimmie Johnson is in 3rd place in the Chase points standing. Driver of the #99 Ford Carl Edwards obtains a one-point gap over Kevin Harvick who came home in 6th place. Edwards and Harvick entered the Kansas race tied with the difference of a single position breaking the draw. A 500-mile night race at Charlotte Motor Speedway is next for the NASCAR Sprint Cup Series. Jamie McMurray won the Charlotte event in 2010 over Kyle Busch.